Surely I’d set myself up for disappointment. There was no way anyonecould live up to the image I’d created in my head. Like the Wizard of Oz, this Wizard of Narcolepsy was sure to disappoint. 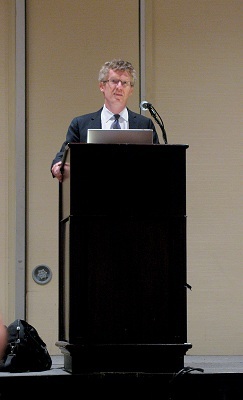 Saturday morning of the Narcolepsy Network conference began with a Keynote Presentation by preeminent narcolepsy researcher, Dr. Emmanuel Mignot of Stanford’s Center for Narcolepsy. I never forgot this description of a relentless scientist ready to cross deserts for narcolepsy. Towards the end of his presentation, Dr. Mignot discussed one of his current projects called the Immunochip Project. He explained that this line of research should help identify what is causing the autoimmune attack in the brains of people who develop narcolepsy. For a while, it was unsure if Dr. Mignot would be able to pursue his Immunochip project as he did not receive the funding he had originally hoped for from the National Institutes of Health (NIH). When Wake Up Narcolepsy learned of this urgent matter, WUN founder Kevin Cosgrove vowed to do everything possible to help move this important project forward. Subsequently, WUN donated $25,000 to Stanford’s Center for narcolepsy, combining with a few other private funding sources, to total $100,000 which allowed the Immunochip project to move forward at a minimal level (although more funding is still needed). Hearing Dr. Mignot discuss this project before a room full of people was a moving experience. It made the whole “I’m running a marathon to raise money for narcolepsy research” very real. Sure, there have been other markers of success. On marathon day – I received a yellow and blue medal and a silver cape. Since then, I’ve received an overwhelming abundance of congratulations and praise from many people. Yet, at 9am this past Saturday, I received the greatest prize of all – in the unlikely form of a PowerPoint slide presentation. Later that day, I got a chance to meet Dr. Mignot. Strangely, this Wizard of Narcolepsy was everything I imagined and more. He has his feet on the ground and his eyes set on the stars. The thing that amazed me the most about Dr. Mignot wasn’t part of his presentation at all. Over the course of the day, I noticed that Dr. Mignot was approached by many people in the hallways, side-tracking him from where he was going. Yet, he treated every single person with dignity and respect. He was never too busy or too important. He looked each individual in the eye and listened. 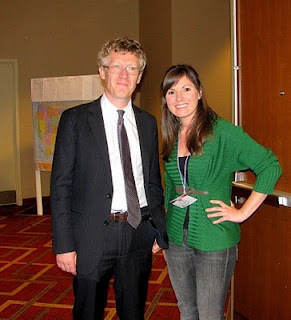 Dr. Mignot is an integral part of our narcolepsy community and I look forward to reporting back as his current research continues towards cracking the autoimmune connection. Check back soon for more updates about the rest of the Narcolepsy Network conference! You are completely correct about Dr. Mignot. At our first conference he just sat down at our lunch table, and there were other doctors at the table that wanted to talk to him but he made sure to keep Jason and I in the conversation and ask Jason for his opinion. He always makes the time even though usually Mali is chasing him out of the building because he is running late to get somewhere! What an interesting perspective. DR Mignot has accomplished so much for PWN. He is overextended on so many levels, but he doesn't seem to wear the look of fatigue quite like I do. Hearing him speak was truly an honor. Kudos to WUN for all your fundraising endeavors. I can understand why you are advocating for us PWN, but do you really think that our condition is a priority? I know that narcolepsy has held me back so far from my full potential, but I'm studying now to be a doctor and there are people in far worse conditions that could use $100,000 to SURVIVE. I am grateful for the knowledge that the science community has uncovered about narcolepsy, but perhaps we could wait our turn. Life is rough for us, thus we can better sympathize with the pain of those with more severe disease. Julie, as a non PWN I appreciate what you are doing and HAVE done for those suffering from your similar conditions. Working for an attorney that suffers from narcolepsy has given me a greater appreciation for my own abilities since they arent hampered by narcolepsy. Dont worry about Negative Nancy (aka Sasha Louisa). She is one person. Take pride in what you have done and what you have dedicated your life too. At least you know that what you have done by merely scratching the surface will change the experience others will have with narcolepsy. Even if you yourself dont get to experience the advances in science at least youve dedicated your life to helping others. P.S. Narcolepsy can put you in a life threatening situation. Dont you read this blog regularly Ms. Medical School? Julie got lost in DC and let me tell ya YOU DONT WANT TO GET LOST IN DC IN THE DARK! Good thing she SURVIVED that!